Nyepi, often referred to as the Balinese Day of Silence, is a Hindu tradition observed as the traditional New Year according to the Balinese Saka calendar. For one day out of the year, the rambunctious nightlife and thumping music in Bali stop. The constant drone of motorbikes ceases for a day as a pleasant, mandatory silence creeps over the entire island. Even the perpetually busy airport in Denpasar (DPS) shuts down for 24 hours! If you are anywhere in Bali, participation in Nyepi is compulsory. Nyepi is a 24-hour period from 6 a.m. until 6 a.m. the next day. Nearby islands such as Nusa Lembongan also observe the rules for Nyepi. Locals get prepared for a day of silence by getting it all out of their systems the night before. Pots and pans are banged, firecrackers are thrown, effigies of demons are burned, and noisy processions walk the streets. Different rituals are performed to drive away evil spirits. The Balinese Day of Silence begins at 6 a.m. on Nyepi and continues for 24 hours until 6 a.m. the following morning. Locals and visitors alike are expected to take the event very seriously. 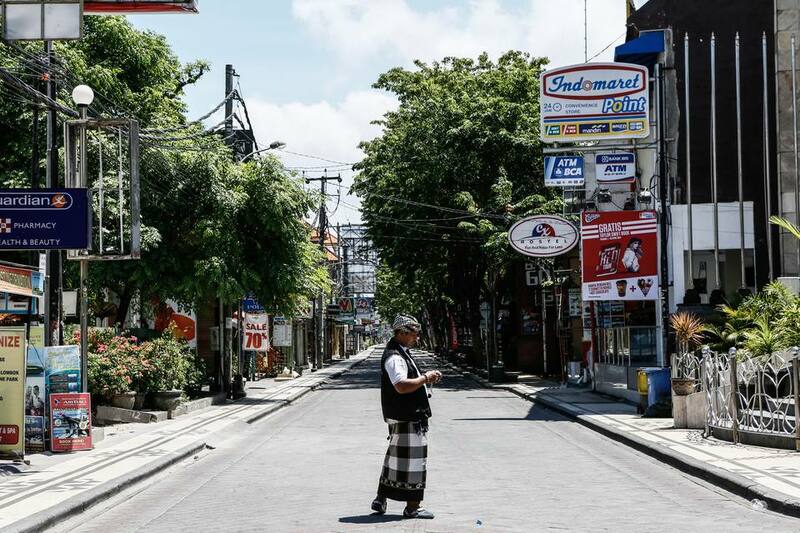 The streets are patrolled by pecalang, security men in traditional garb, to ensure that there are no infractions. Although tourists aren’t expected to fast or meditate as many locals do, they are expected to stay inside the hotel grounds and not cause disturbances. Even lights should be dimmed, and excessive talking kept hushed. You'll want a comfy hotel room, perhaps with food service, for waiting out Nyepi. Many hotels will offer food (nicer places will even set up special buffets), however, they may be understaffed as employees take part in rituals and celebrations in their home villages. All businesses close; televisions and radios are silenced. You'll have to eat inside your hotel. No one is allowed to move around the island other than the security patrols and emergency vehicles on life-saving missions. Nyepi is a public holiday in Indonesia known in Bahasa Indonesia as Hari Raya Nyepi. The day after Nyepi is known as Ngembak Geni (relighting the fires). The Balinese Day of Silence will certainly affect your trip to Bali if the two coincide. Ngurah Rai International Airport (DPS) in Denpasar closes down for 24 hours with no flights allowed to arrive or depart. All transportation around Bali stops moving — plan accordingly! As a tourist, you won’t be exempt from observing the Balinese Day of Silence. Beaches are off limits, most bars and restaurants closed, and you won’t be allowed to walk in the streets. Unless you're about to give birth — one of the few ways to be exempt from observing Nyepi — you'll have to learn to do nothing. The day is a good time to relax, read a book, and listen to the natural sounds of Bali otherwise obscured by traffic. Experiencing Nyepi is quite unique and memorable, especially the party the day before and omedan-omedan, the bizarre "Kissing Ceremony" held in Denpasar on the day after. But if you only have a week, you may not want to spend a whole day relegated indoors. The way to avoid Bali's Day of Silence is simple: Don't go to the island! Indonesia is an archipelago of over 17,000 islands — choose another one until the holiday is finished. You could jump over to nearby Lombok, or better yet, take a speedboat up to one of the Gili Islands. Transportation will definitely be affected during the Nyepi holiday period, and other travelers will have the same idea, so book in advance. Note: Going to nearby Nusa Lembongan or Nusa Penida is not an option; both islands enforce silence during Nyepi. Those artistic, colorful demon statues are known as ogoh-ogoh. Each village crafts and constructs an ogoh-ogoh; the village youth play a vital role in the design and construction. Most ogoh-ogoh are carried in a procession and then burned in a ritual, although a few end up on display. They can be seen in different parts of the island. If you spot an ogoh-ogoh procession turning in circles at intersections, they aren't lost. This is done deliberately to confound any evil spirits that may have been following along.